"The federal government fought the war on poverty & poverty won." – From President Reagan's 1988 State of the Union address regarding LBJ's 1964 State of the Union address where LBJ declared an "unconditional war on poverty." Subscribers to RTE were not fooled last Friday by the headline jobs report that announced that the government's official unemployment rate (U3) fell from 7.0% in November to 6.7% in December. BO is counting on uninformed people (most of us) upon hearing this news thinking that the prospects of the middle class are getting better – despite what their own circumstances tell them. BO continues to test just how dumb we are – & of course he found out twice - in 2008 & 2012. The unreliability of the U3 unemployment measure has always been true but in normal economic times it would suffice to give an accurate enough portrayal of the health of the job market. U3 breaks down in severe economic conditions like BO has induced on America the past five years. For instance part-time workers counted as employed by U-3 could be working as little as one hour a week. Some employment statistic! According to the BLS (Summary Table A Household Data) the number of unemployed people in America declined by 490,000 in December. Sounds good until you realize that 347,000 of these people (70% of the total) are not counted as unemployed because they dropped out of the labor force. Coupling these drop outs with the 178,000 person population growth increase - who are also not in the labor force brings the total number of Americans who have no job and are not looking for one to almost 92-million people (37.2% of the civilian noninstitutional population). 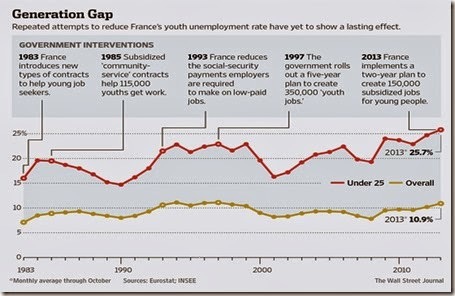 Now the whole idea of Democrats for the past 80 years has been to make America's government dependence look like that of socialist France as shown on the above graph – with unemployment centered around 10% for the last 30 years & unemployment of French people under 25 centering around 20%. 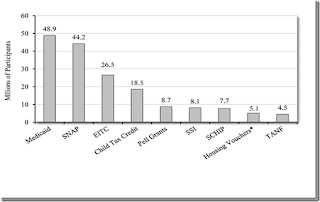 One of the country's leading experts on poverty studies Robert Rector, of the Heritage Foundation, recently wrote in the WSJ that "the federal government currently runs more than 80 means -tested welfare programs . 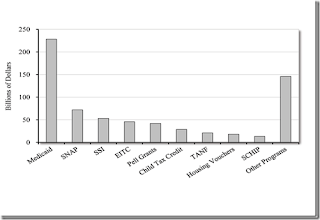 . . & that government spent $916 billion on these programs in 2012 alone, & roughly 100 million Americans (just about the same number as the 92 million listed above that are not in the civilian noninstitutional workforce) received aid from @ least one of them, @ an average cost of $9,000 per recipient. . . Federal & state welfare spending, adjusted for inflation, is 16 times greater than it was in 1964." 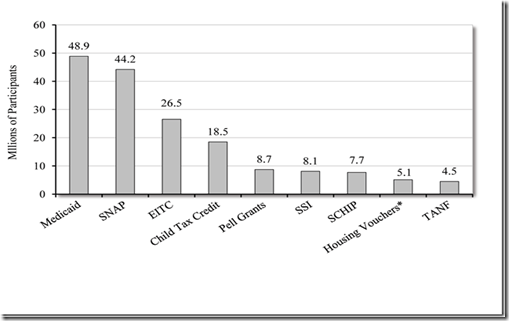 See graphs below from the Cato Institute for 2011 costs & enrollment figures for the largest welfare programs. 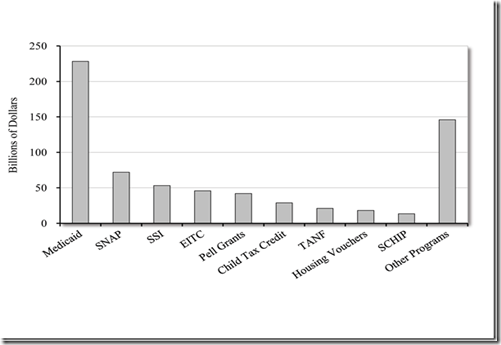 Examples (but far from all) of other welfare programs include National School Lunch Program, Maternal, Infant, & Early Childhood Home Visiting Program, Special Supplemental Nutritional Program for Woman, Infants, & Children (WIC), Head Start, Child Care and Development Block Grant, Low Income Home Energy Assistance, Foster Care Title IV, Public and Indian Housing, State Administrative Matching Grants for SNAP, Child Care and Development Mandatory & Matching Funds, School Breakfast Program, Adoption Assistance, Public Housing Capital Fund, Federal Work Study Program, Rural Rental Assistance Payments, Work Investment Act (WIA) Youth Activities, WIA Adult Program, Stephanie Tubbs Jones Child Welfare Program, & Weatherization Assistance for Low Income Persons. Cato also reports that "Overall, government payouts, including middle-class entitlements, now account for more than a third of all wages and salaries in the United States. 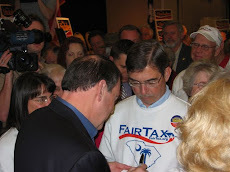 Worse, if one includes salaries from government employment, more than half of Americans receive a substantial portion of their income from the government." When over half the country has such a direct interest in continuing the war on poverty it makes it very hard for a limited-government candidate to win a national election going forward. Heritage's Mr. Rector continues "Not even government, though, can spend $9,000 per recipient a year and have no impact on living standards. And it shows: Current poverty has little resemblance to poverty 50 years ago. According to a variety of government sources, including census data and surveys by federal agencies, the typical American living below the poverty level in 2013 lives in a house or apartment that is in good repair, equipped with air conditioning and cable TV. His home is larger than the home of the average nonpoor French, German or English man. He has a car, multiple color TVs and a DVD player. More than half the poor have computers and a third have wide, flat-screen TVs. The overwhelming majority of poor Americans are not undernourished and did not suffer from hunger for even one day of the previous year." When talking about the poor today it is clear from the above that we are not talking about people dying in the street – in fact we were never talking about that. The above description is a far cry from people that New Dealers called ill-fed, ill-housed, or ill-clothed eight decades ago. Think of your first TV & then first color TV & even the first time you had cable TV in your house, & then the first time you air conditioned a room or maybe two – did you consider yourself living below the poverty level before or during these times? For everyone who has travelled to Europe but not to the poverty struck neighborhoods of America it is hard to believe that the typical American living below the poverty level has a home that is larger than the home of the average nonpoor French, German, or English man. Just like the real goal of Democrats regarding healthcare is to have a universal single payer system so too the real Democrat goal regarding fighting poverty is to make everyone dependent on government – not eliminating poverty as we knew it in 1964 which Democrats cared nothing about. Democrats really don't want a world of self responsibility – they want government dependent people. Who can see the advancement of freedom, self respect, & human dignity with a continuation of the rising employment drop out rate depicted above coupled with a rising number of people classified as poor living lives that never would be thought of as poverty anywhere else in the world but America? The problem occurs when America runs out of productive people to fund this elevated poverty-level state (& such productive people won't be found living in their parents' basements) – then the poverty-level standard of living will fall to nothing but of course so will everyone else's. After all of these years do we still believe we need government like we did in the 1930s or even 50 years ago this month when the war on poverty was declared. In this sense the taxpayers paying for the war on poverty are providing the path to victory for the Democrat parties' completion of this portion of the socialization of America. It is the wealth stored in America that attracts the opportunists like BO to our country. Taking control of this wealth as well as control of the American people through programs like ObamaCare is what Democrats have always been about & it certainly has accelerated under BO. 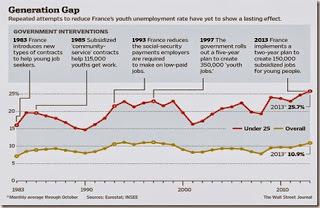 Just look @ the graph below from IBD that shows America's unemployment -underemployment U6 rate that has centered around 10% for the past twenty years – just like France's unemployment rate. U6 was 13.1% in December – unchanged from November - & it won't get better any time soon unless the citizens of America, who our Founders set up as sovereign, do something about it. Republicans will become as antiquated as black & white TV. Great posting! 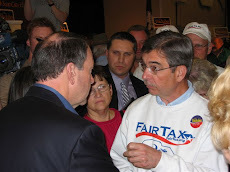 Once a government welfare program is started, it is very difficult to eliminate. If you tried millions of low income people would riot. I believe gov't policy should be to ever so often give them a "free be" (another welfare program) to keep them in check. Then they would not riot and cause property damage, etc. When it ends, will be long after I am gone. A very sad commentary - but a theory that has been around for decades. The "they" BZ refers to are the people our Founders set up as sovereign. In essence what you describe in your post is a " war on work ". IBD Op Ed http://news.investors.com/ibd-editorials-perspective/011714-686845-government-punishes-work-rewards-dependency.htm came up with this phrase and supplements your post well. What a great campaign slogan against the Left - "war on work". Let's keep on calling out the economic insane policies of the Left. It may be our best chance to reverse the socialist jungle.